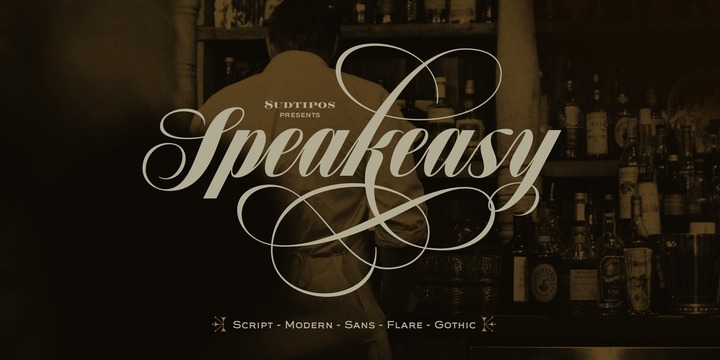 Speakeasy is a modern sans typeface created by Alejandro Paul and published by Sudtypos which is available in 5 styles and two way of connection, Swashes, Alternates, Ligatures and more. Initially, it was designed to be suitable for menu, restaurant sign but it merge well on logo, packaging, invitation etc. Speakeasy can make you look classy. Styles: Script, Modern, Flare, Gothic, Sans. Price: starting from $39 for one font to $149 for all 5 fonts. A font description published on Tuesday, May 29th, 2018 in Alejandro Paul, Fonts, Sudtipos by Alexandra that has 2,362 views.